In 1977 (the Year of Star Wars) Yves Hayat was in the record industry, working for French label Barclay Records. With all the hysteria and hype surrounding the cinematic blockbuster, Hayat felt suitably inspired to make his own musical tribute to the quasi mystical space opera. A keyboard player called Richard Lornac (who was a musician on Barclay Records rare Afrobeat LP Tumblack) and drummer Jean-Paul Batailley completed the band. And the name of said band? The suitably derivative ‘Droids’ no less. A first single from the band, with the in-no-way-a-cash-in-of star-wars title ‘The Force’ was released, and fans of Space Disco were treated to a performance of the band on French TV, accompanied by a lady dancer/droid.swinging her legs with abandon and not displaying typical droid behaviour. I do not know what C-3PO would have made it. I have a good idea what Daft Punk would have made of it though – wonder if this was in any way an early influence on them? For more on Space Disco – see here and here. After all these years and all the various iterations of the franchise across many platforms, it is this game, from Atari, first released in1983, that remains the best Star Wars game on any system / platform. 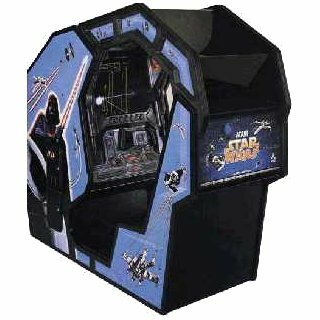 When you saw it sitting in an arcade, it drew you towards it like no other cabinet. It was quite normal to have a crowd around it, and a queue to play it. 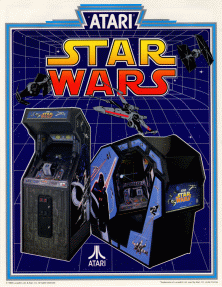 One of the all time great Film – Arcade conversions, and one that took many of my 50p coins in the mid eighties. Why? Simple. It is an incredibly immersive experience, especially when you are sitting in the arcade cabinet / cockpit. This, combined with the sounds of Star Wars (the chirping of R2-D2, the calming voice of Obi Wan, the roar of Chewbacca, the whizzing TIE fighters, the MUSIC!!!). It takes its cues from the original film. 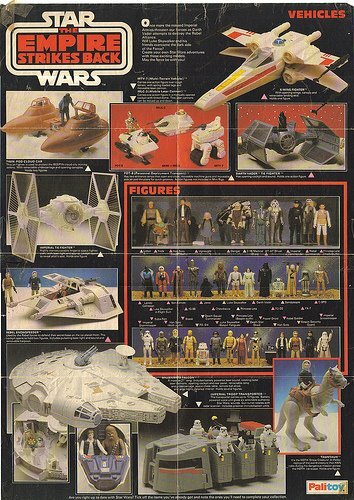 It is inspired by one of the most exciting flying/dogfight sequences in Cinema history and puts you in the cockpit of an X-wing fighter attacking the Death Star. 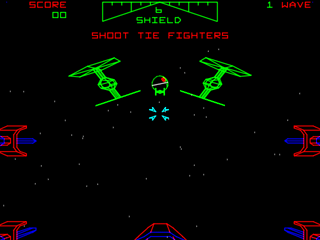 The game is in three stages: First you have to shoot the Tie-fighters before they shoot you. 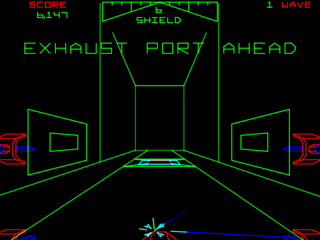 Then you fly down to the surface of the Death Star and shoot the towers.At the climax of the game, you get to fly down the trench and shoot the photon torpedoes into the Death Star’s exhaust port (its Achilles Heal) to finish. Once you achieve that, there is a wonderful end screen that shows your handiwork, as the Death Star explodes. Victory to the rebellion! Then you get to go back to the start and do it again only this time it gets harder. Awesome. Better than anything managed in the live action prequels, better than most anything in the new Clone Wars CGI series, this is just a trailer for the new MMOPRG (massive multiplayer online role playing game) thats due out soon. The joys of flickr – flicking through other peoples memories, preserving the past. I want to try and find some catalogue page scans of the old hi-fi’s that had a turntable and a front mounted cassette player. They will be out there, and I will find them.